Simple deviled eggs are turned into a fun and delicious Halloween party appetizer. 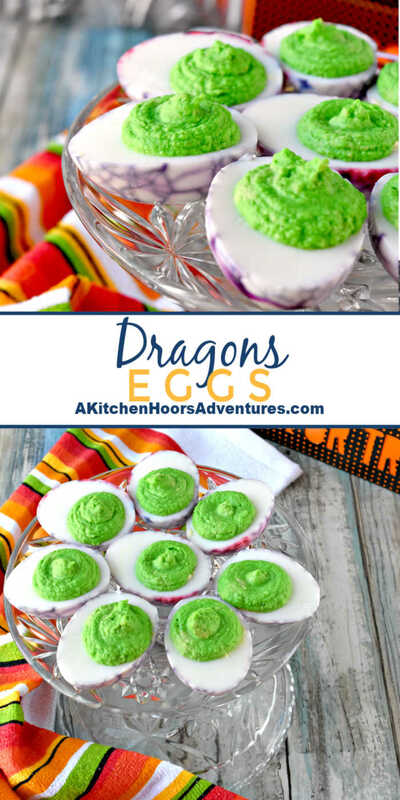 Dragons Eggs are avocado deviled eggs with a kick of garlic making them creamy with a spicy garlic kick. This post and recipe was created for #HalloweenTreatsWeek! I was sent samples by some of the sponsor companies but as always opinions are 100% mine. I’m having so much fun with #HalloweenTreatsWeek. Aren’t you? I love all the recipes the other 29 bloggers have been sharing. They all look so delicious and so festive! I had no idea making Halloween recipes could be so much fun. I’ll have to do this again next year. As I was perusing Pinterest, I stumbled on these eggs that looked really cool. 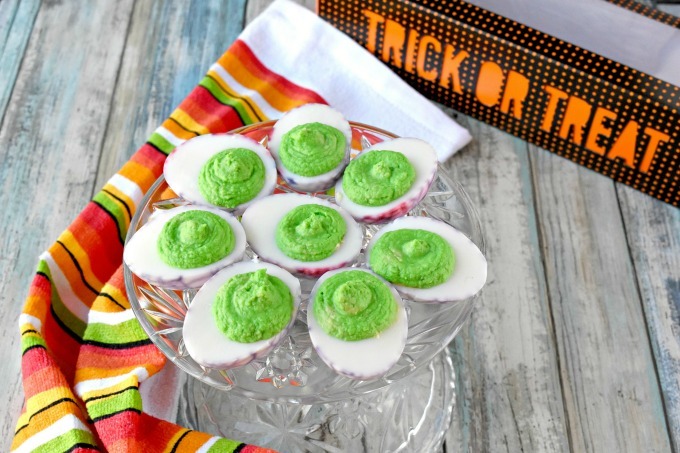 And I thought, “I really need to make those for Halloween!” Then I was chosen to participate in this event and knew it would be the perfect excuse to make these delicious and fun deviled eggs. However, I didn’t want to fill with your standard deviled egg filling. To me, that would be a bit of a letdown. You have these really cool looking eggs on the outside and you bite into the standard mayonnaise and relish, Southern style egg. *yawn* I really wanted to kick it up and make something worthy of being called Dragon Eggs! Now, when I think of a dragon, the colors that come to mind are purple and green. I have no idea why. They just do. Even though dragons have been portrayed in a myriad of colors in all types of media, I think of purple and green. Well, I couldn’t really think of anything naturally purple to color the filling of these eggs. I guess there’s purple cabbage, but that just doesn’t sound appealing does it? I supposed I could have used beets, but they’re more of a red instead of purple. Purple potatoes? Nah. You don’t fill deviled eggs with potatoes. I guess you could, but that doesn’t sound any better than cabbage. So, it’s decided then! Purple eggs on the outside and green on the inside. That means the obvious choice would be avocado! I’ve never made avocado deviled eggs and heard they were really good. You would even replace the mayonnaise with avocado, though I’m still skeptical on that one. As you can see, I did add mayonnaise these eggs. I thought I picked a good avocado, but it was almost rock hard and would not mash if its life depended on it. I should have grabbed the ricer, but I didn’t. Instead, I wound up just mashing it up with my hands enough and then just gave up. Finally, put it in the processor and made the filing that way. Now, I had intended to add some pickled jalapenos to the mix, but they didn’t look quite right. Of course, being the food hoarder that I am, they’ve probably been in the fridge since before I met the hubs. By the way, we’re going on over 10 years together. Just sayin. Yeah, that’s what I said when I tossed them out. Ew. I was thinking about spicing them up and breathing fire and all and then it hit me. Add some fresh garlic! That will put some hair on these eggs and give it a kick you wouldn’t expect AT ALL! So, that’s just what I did. I grated a whole clove of garlic into these bad boys. That’s exactly what they needed. It gave that little added extra bit of flavor that I wanted to make these a little different than your typical deviled eggs. There I was, standing in the kitchen looking at the filling thinking, “It’s not green enough.” How in the world did all those people on Pinterest get their eggs to look so danged green? It was more of a muted avocado color and not a bright green like I had hoped. So, what’s a girl to do? Add some Adam’s Extracts to her egg filling! I already used their red and blue to make the purple for the outside of the eggs. I had no idea I was going to use their green to make the inside greener. But that did the trick! It was just a touch of color to make the green pop. And I don’t even have to worry about there being that fake color flavor because Adam’s Extracts just don’t leave that fake flavor in your foods. They’re good like that. Now, tell me your kids wouldn’t devour those suckers! Just look at how fun and colorful they are! 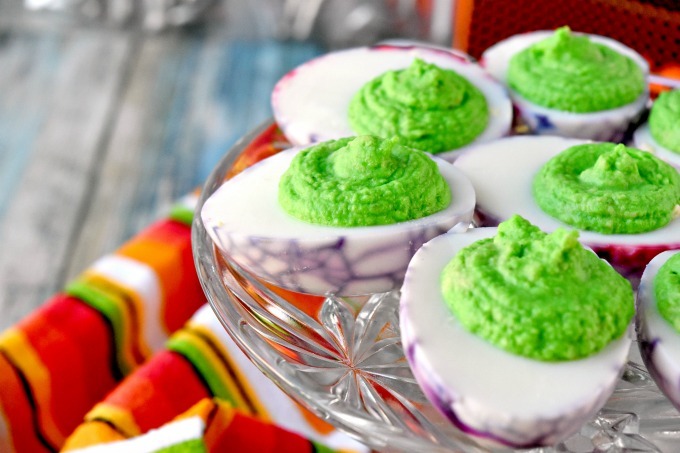 If you can boil eggs and use a food processor, then you can make these at you Halloween potlucks. I’ve even given you special instructions on how I make easy to peel delicious eggs. Honestly. I’ve been cooking my eggs like this for over a year now and I have had little issues with peeling them or getting that icky green ring of an overcooked egg. If I continued to make them his way, I’d have torn up outsides and that icky green ring on the inside. Trust in the instructions. And trust in Adam’s Extracts. They have the best extracts and food coloring. I use them all the time and have never been disappointed. Make sure to get a head start on the giveaway and follow them on Facebook, Pinterest, Twitter, and Instagram. Bring a saucepan of water to boil. Using a slotted spoon, carefully add the eggs one at a time. Cook for 10 minutes. Remove from heat and rinse in cold water. Take a spoon and carefully crack the eggs all around. Combine the red and blue food coloring in a color safe bowl along with the vinegar. Add the eggs and enough water to coat and refrigerate 12 hours. Combine the yolks with remaining ingredients (avocado through cayenne pepper) and stir until creamy and well combined. Using a piping bag, pipe the filling into the egg white halves. Refrigerate until ready to serve. For our very first #HalloweenTreatsWeek event we have 30 talented bloggers that are sharing their favorite Halloween recipes throughout the week! There are over 100 Halloween themed recipes for year’s #HalloweenTreatsWeek and we can’t wait for you to see them all! Giveaway open to US Residents 18 years or older. All entries will be verified. No PO Boxes Please. Sponsors will send prizes directly from sponsors to winners, bloggers are not responsible for prizes. This giveaway runs from October 1st – October 6th at 12AMEST. Winners will be selected soon afterward and contacted by e-mail. Winners have 48 hours to respond or a new winner will be chosen. There are a total of 5 (five) prizes and therefore we will have a total of 5 (five) winners. No purchase necessary. Void where prohibited by law. And they are packed with avocado flavor, too. So good and so fun! I can think of so many movies that I’d love to serve these with. The kids would love them! There are so many dragon movies for a dragon theme night. I love the idea of using food coloring to marble the eggs. These look fabulous. So fun, right? You can use different colors for other holidays. Red and blue for the Fourth of July? Red and green for Christmas?